We awoke at 3 am in our hotel room in Munich. Half asleep we showered, dressed, and packed our bags ready to travel to Italy. We stopped by Mom and Oma's room to say our goodbyes, called a cab, and headed to the airport. It was bitterly cold in Munich that day, with the first fog of the season rolling in. We arrived at the airport, checked in for our flight, had some coffee and played cards, and soon boarded our plane. Before we knew it, we were up in the air over the Dolomite Alps, and even sooner we touched down in Venice. As we walked down the steps of the plane, we could immediately smell the salty, ocean air; so comforting for those of us that live near the ocean. We got inside the airport, grabbed our bags, and waited to board our bus that would take us into the heart of Venice. Tired and and little foggy from our early morning flight, we were pretty quiet the whole time. When we got off the bus, it took us a couple minutes to find the vaperetto station, but soon enough we (and all of our luggage) were loaded onto the boat and we began to sail down the canal. Venice was everything that I thought it would be - and more. From the very beginning, this city captured my heart. If I had to choose one (and only one) city to return to tomorrow, it would probably be Venice. I have a feeling that Hubby would also agree. Armed with a map and determined not to get lost in Venice's confusing streets, we disembarked from the boat and made our way to our bed and breakfast. When we arrived, we were greeted with a warm, friendly welcome. We couldn't check into our room yet (as it was still really early), so we freshened up a bit and headed out for a bite to eat and some exploring. We walked along the edge of Venice and looked onto the ocean. Soon we found a little pizza place and decided to stop for a bite to eat before lunch. We kept exclaiming "this is the best pizza I've ever had". It was delicious. After we were no longer hangry, we decided to wander around and do some shopping. We wandered around the maze of streets, browsing through the little shops. We spotted an old, authentic Italian shoe store and decided to take a look at their selection. Hubby ended up finding a sleek pair of leather dress shoes for a reasonable price. After all the window (and real) shopping, we decided that it was time for a real lunch. We stopped at a nearby cafe, with a view of the grand canal, to order a simple lunch of pizza and caprese salad (and wine, of course). We lingered at the restaurant, soaking up the Italian sun, the good wine, and each other. Finally, we were so tired that we decided to go back to our room for a quick nap. A few hours later, we woke up and we couldn't wait to explore some more. After wandering around, exploring the shops, canals, and streets, we found a perfect little restaurant for dinner. We sat down and enjoyed fresh pasta, Italian wine, each other, and the cool evening air. It was the perfect evening. The next morning we awoke early, ready for our first full day of sightseeing in Venice. We headed down the to the tourist centre of Venice: the Piazza San Marco. We decided to visit San Marco's Basilica first. This is one of the most beautiful churches that I've ever seen. The marble-covered exterior and mosaic-filled interior was absolutely breathtaking. Although entry into the church itself was free, Hubby and I decided to pay a few Euros extra to enter the museum. It was so worth it as this also grants you access to the terrace where you get a fantastic bird's eye view of the Piazza. After San Marco's, the Piazza was getting really crowded with tourists, so we decided to head to the less tourist-y area to grab some lunch. We headed towards the Guggenheim museum, picked up a panini, and sat on one of the many bridges and ate it while soaking up the Venetian sun. Hubby agreed to visit the Guggenheim museum to satisfy my desire to see some modern art. The museum itself it not that big, but it houses a fantastic collection of modern art and it located in Peggy Guggenheim's former house, situated along the grand canal. We saw works by some of the most amazing masters of modern art: Dali, Pollock, and Picasso (among many, many others). Standing in front of a real Pollock was one of my dreams come true. Afterwards, we headed back towards our "home". On our way back, we stopped at a local mask maker's shop to pick up a gift for our dear friend who was house (and cat) sitting for us while we were away. When we got home, we changed and headed out for a nice dinner. We had a fantastic meal and chatted with another couple who were also staying at our bed and breakfast. Sitting outside, watching the sun go down, and eating amazing food made us feel very blessed to be able to live the life that we do. After dinner we headed back home to change into come more boat-friendly clothes for our gondola ride. 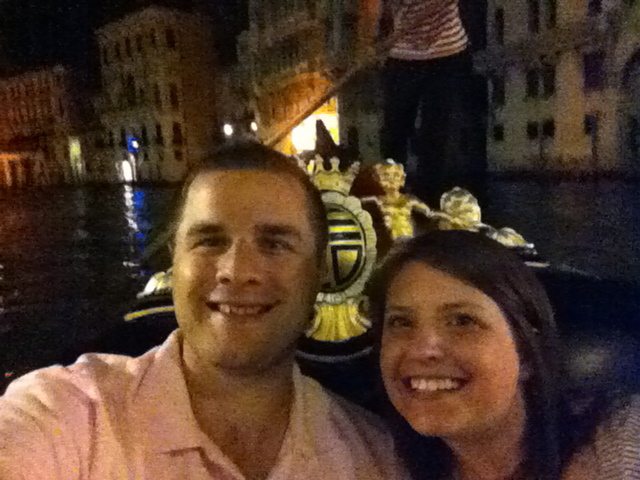 We weren't planing on taking a gondola ride, as they're insanely expensive. However, Mom and Oma couldn't bare the thought of us visiting Venice and not taking a gondola ride, so they surprised us with a generous gift before we left Munich. So generous. As we drifted through the canals, the normally busy and bustling Venice was calm and quiet. All we could hear was the water lapping against our gondola and sound of laughter and clinking dishes coming from the windows of the canal-side homes. It was one of the most romantic moments of my life. A moment that I will never, ever forget. Love your post. My husband and I are celebrating our 3rd anniversary in Venice over the NYE holiday this year. Do you remember any of your favorite restaurant names that you visited? Would love any advice! Hard to believe our trip is almost here! I'm so jealous that you'll soon be in Venice! Hubby and I both want to go back immediately! I remember the name of one restaurant we ate at: Osteria L'Orto Dei Mori (www.osteriaortodeimori.com) - it was recommended by our hotel and it was fabulous. We also had some pre-dinner drinks at the Barco Jazz Club (www.barcojazz.com) one evening and it was great. A little "American-ized" but they have 2 for 1 happy hour, which was a cheaper way to enjoy a traditional Beilini than Harry's Bar where they're about 18 Euros each. Also, if you do take a gondola ride make sure to take it in the evening - much more romantic (and less crowded) than during the day. Expect to pay about 100 Euros for the ride though.